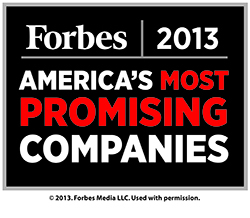 Forbes magazine ranked the top 100 "Most Promising Companies" in the nation. OtterBox was honored at No. 10 as the only company in the consumer durable goods category, third largest by revenue and seventh largest by employment. The Forbes ranking honors high-growth companies using an in-depth analysis provided by Manhattan-based data research firm CB Insights. Thousands of applications are reviewed over the course of six months and finalists are rated on factors of growth, quality of management team and investors, margins, market size and key partnerships.